This report gives an overall assessment of the worldwide surfactants business. It provides an up-to-date view of the surfactants industry, products, markets, market participants, and relevant issues. The surfactants industry is considered complex because of factors such as a broad-range definition of the term surfactants; a large number of suppliers (more than 500 worldwide); numerous product chemistries (more than 3,500), intermediates, and blends; a combination of low- and high-profit products and businesses; a wide range of applications and customer base; variable captive production and merchant markets; and interproducer business relationships and sales. Growth for surfactants will be driven predominantly by Asian markets, where emerging markets such as India and Vietnam will continue to expand at rates above the regional average. China will continue to show healthy growth rates of about 4% per year, although this is a more modest rate compared with growth over the last five years. Markets such as the United States, Western Europe, and Japan are predicted to show growth rates in the range of 1.2–1.6% per year, indicative of their maturity, economic outlook, and demographics. The focus in mature markets will remain on product interchangeability based on raw material cost development, legislation, and continued customer and corporate focus on sustainability and the environmental impact of surfactant usage. Household detergents remain the most important application sector for surfactants, accounting for approximately 46% of global consumption in the major consuming regions, with an average annual growth rate of 2% expected over the next five years. Growth in industrial and institutional applications is expected to be slightly higher. Personal care applications remain an increasingly important sector for surfactant consumption, representing 14% of total global consumption, but are expected to show a higher-than-average growth rate over the forecast period. 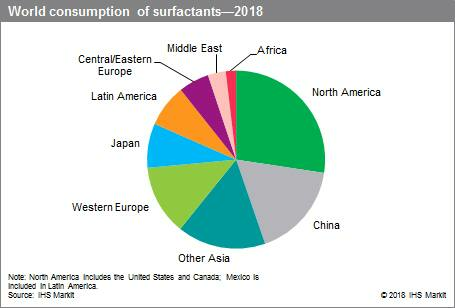 The North American surfactants business grew modestly during 2015–18 on a volume basis, with total surfactant demand growing at an average annual rate of approximately 1.6%—slightly higher paced than during 2012–15. An improving economy, increased consumer spending, lower crude oil prices, some consumer switching back to buying higherperformance detergents (with higher active levels), and some shift by formulators and detergent manufacturers to formulations with higher active levels helped increase volumes. A stronger economy helped boost the consumption of surfactants in markets such as personal care (2015–18), agriculture (2015–18), and energy-related applications (oil field, during 2017–18, when crude oil prices picked back up). Value increased overall during 2015–18, as producers were able to pass along price hikes resulting from higher raw material costs, particularly in 2017 and 2018. The Chinese surfactant market witnessed steady growth during 2013–18, driven by rapidly increasing consumption of detergents for both household and industrial/institutional cleaning, resulting from the rapid increase in population, urbanization, rising incomes, improvements in living standards, and increased awareness of health and hygiene. China’s surfactant industry is more involved in the production of commodity-type surfactants. Anionic surfactants, with stable market scales, and mature processes and formulation technologies in the end-use markets, are the most-used type among the four categories. China is still a net importer of nonionic surfactants, reflecting growth potential, although anionic surfactants will still remain dominant in the future. Amphoteric and cationic types of surfactants are at the developmental stage with average annual growth rates of 6–8%. China will try to upgrade its surfactant/detergent industry in many aspects of product varieties, market structure, brand building, standardization, and system improvement. Low cost, multifunctionality, environmental friendliness, and safety concerns are the four main focuses of surfactant development. Liquid detergents continue to take market shares from powder detergents, while surfactants based on oil and fat are also showing good growth opportunities in the next few years. Overall consumption of surfactants in China is expected to increase at an average annual rate of about 4% over the next five years. The Asian market has the highest growth potential for the detergent industry. India is also a promising market. Growing demand in Asian countries for more sophisticated products, including household detergents, personal care products, and industrial detergents has led to increased demand for surfactants. Therefore, most global surfactant manufacturers have established production bases and marketing channels in Asia and expanded their operations. In developed Asia Pacific countries such as Japan, South Korea, Taiwan, Singapore, and Australia, the surfactant market is mature and highly competitive. Therefore, overall demand for surfactants in these countries is expected to increase only slightly or remain unchanged over the next five years. Europe’s share of global consumption by volume has declined from 25% to 22% since 2015, with the continued growth of new markets around the world. The United States and Canada now account for 20%, while China and Other Asia account for 19% and 18%, respectively. The highest growth rates in consumption are expected for China, Other Asia, and Africa. World demand for surfactants is forecast to increase at an average annual rate of 2.6% during 2018–23.